A thoughtful gift for road trips, the office or small group gathering. 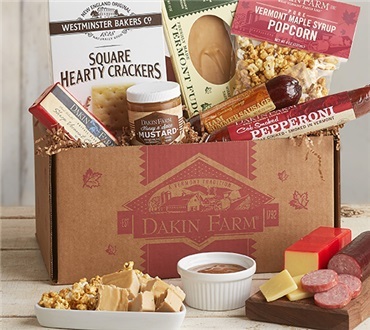 Let Dakin Farm help you show your appreciation and share smiles all around. Or try our NEW variation with our famous cob-smoked pepperoni. The variety was good and the tastes were delicious. I would buy this over and over again. Loved everything in the package especially the mustard I even put it on the popcorn. Everything was fresh and delicious. Would definitely order again. Scrumptious Vermont Treats, not just Tasty!